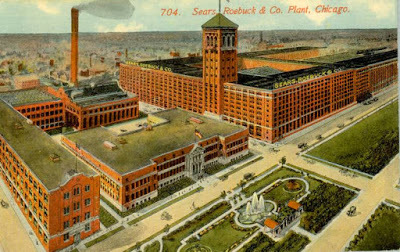 Like Louis Horowitz, Paul Starrett, in his autobiography Changing the Skyline, wrote about the Sears, Roebuck plant. Although in Paul’s account, it was his brother-in-law, “Will Dinwiddie” who made the offer of $1 and the handshake deal to Julius Rosenwald. And it is Paul who wrote that Mr Rosenwald presented Will with $75,000 in Sears, Roebuck stock. Although I don’t have any paperwork to back up my hypothesis—it is purely conjecture on my part—I think that Bill saw an opportunity, and took it. It’s my assumption that when Bill submitted his resignation to Louis Horowitz at Thompson Starrett in New York, he took his Sears, Roebuck stock—which had most likely matured greatly by then—cashed it out, and started his own business. 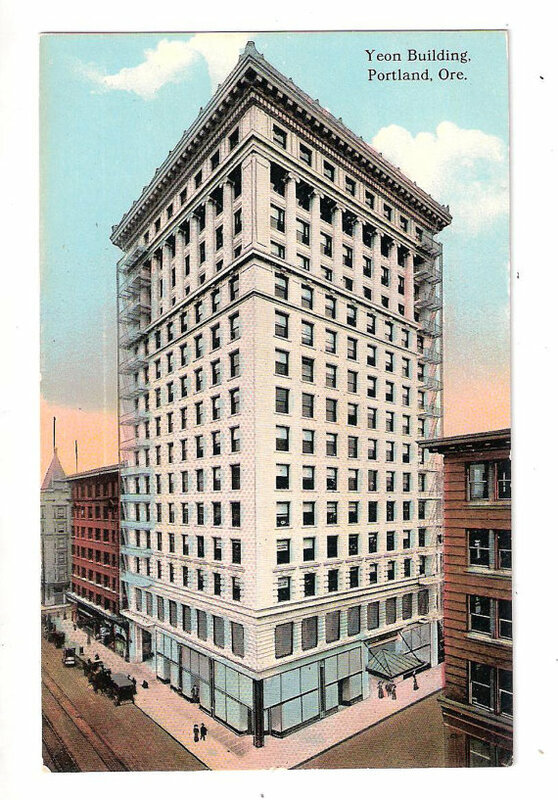 From his office in the Yeon Building in Portland, Oregon—the city’s first skyscraper, a record-breaking building he had bossed for the Thompson Starrett Company—the Dinwiddie Construction Company was born. I recently received a copy of this letter, sent to my great grandfather by Albert H Loeb, Vice President of Sears, Roebuck & Company in 1912. I’m not sure if my new friends at Hathaway-Dinwiddie in San Francisco know how much this single piece of paper means to me! I was speechless when I read it the first time! William Stewart Dinwiddie, that green kid from the sticks who, just two decades earlier had tumbled out of a cab onto the sidewalk in Chicago wearing a threadbare cavalry coat and carrying a basket of leftover bits of food was now the boss of his own company. He was living the American Dream. The kid who came from virtually nothing was now calling the shots. The American West was booming, and though he had the skills, the drive, and the tenacity to run one of the largest contracting firms in the country, he wanted something else. He wanted a company where he could keep construction volume at a small, manageable level with low overhead. At 40 years old, Bill Dinwiddie was ready to live a simpler life on his own terms. He was ready to work to live—not live to work. With the promise of a contract to build the Davenport Hotel in Spokane, the Dinwiddie family pulled up stakes and moved to Washington. They settled in a home in Portland, and began their new lives. The Davenport was to be the debut of the Dinwiddie Construction Company, and the cornerstone of Bill’s new business. But when the time came, his contact with the Davenport project had lost control in the financing, and the contract went to another firm. Without this first contract, the Dinwiddie Construction Company would be unable to explode out of the gates with a bang. Starting out would take a little more time and a little more patience. Months passed and the Dinwiddie bank account was rapidly dwindling. Finally, Bill—as the Dinwiddie Construction Company—got his first big break. On April 3, 1912, the Oregon Journal ran a large advertisement for their new home office building in Portland, announcing Dinwiddie Construction Company as the builder. The four-column width ad invited readers to come and watch the new building rise, and guaranteed that the Dinwiddie Construction Company would minimize investment and maximize profit for anyone looking to build. Finances on that first project were slim. Bill was barely able to raise enough credit to see him through construction. Somehow, he eked his way through the Journal Tower (1912) successfully. 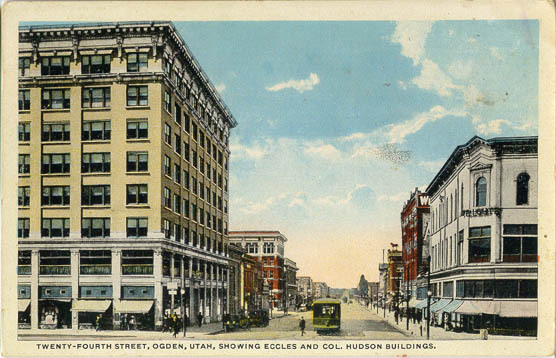 Soon to follow were the Eccles Building in Ogden, Utah (1914) and Portland’s Northwestern Bank Building (1913) and the Meier & Frank Building (1915). In 1915, William Stewart Dinwiddie Jr was born—completing the beautiful family of five handsome, smart, and strong-willed boys. Contacts he had made in New York also began to bear fruit as Dinwiddie Construction blossomed. By 1919, this new company had so many contracts in San Francisco that the whole family—and Dinwiddie Construction—officially relocated to the San Francisco east bay area. Historical photograph taken during the construction of the Columbia Gorge Hotel in 1919. The sign attached to the shed (at left) says “Dinwiddie Construction Company. Photograph from the Hood River Historical Society Collection. It’s pretty impressive to note that the first FIVE buildings built by the Dinwiddie Construction Company have been added to the National Register of Historic Places. Although this distinction made by the United States Federal Government is mostly a symbolic gesture, the NRHP offers financial incentives to a building’s owners to protect these historically relevant buildings. Though these buildings are not guaranteed protection, they have been deemed worthy of preservation by national and local historical and preservation groups. Since 1966, more than one million buildings, structures, objects and areas have been added to the Register– and only 80,000 buildings are listed individually. The first five Dinwiddie buildings are each around 100 years old, and they are all still beautiful, structurally sound, and worthy of preservation. I beamed with pride as I researched each of these buildings, recorded their Register numbers, and learned that they all are historically relevant buildings. I think Bill is smiling too. If he’s not, he should be! My dad worked for Dinwiddie Construction in the 50’s, and we have memories of going to the Dinwiddies house in Belvedere. I wondered if Julie has any information on which Dinwiddie this was. My dad was Miles Covill. Hi Debbie! In the 1950’s it probably would’ve been Jim Dinwiddie, if it was one of the Dinwiddies from the construction company. But by the 50’s, they were in Lafayette, so it could’ve been one of his brothers? Or it could’ve been one of the Smiths? Thank you for your reply! The reason I was asking is because of an ad for Lee workwear by John Falter from the 50’s. It shows men working at a house being built. We have a copy because my dad is the guy doing the surveying in the picture, and the house was supposedly Dinwiddies. If you google it, it comes up as a pinterest post. Kind of interesting. The other people besides my dad were added to the scene, so I hear.